From Cooking with Foliage La Sertoma of Apopka, we have Greta Howard’s Crab Casserole Supreme. About the “scant” tablespoon of lemon juice, this means a little less than a tablespoon. The recipe for Baked Ham comes from Paths of Sunshine Cookbook, published by the Florida Federation of Garden Clubs. 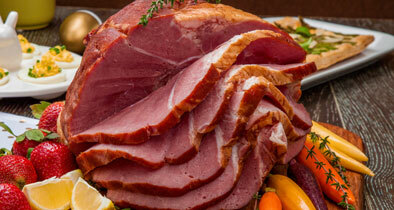 Since it is getting near Easter, you might enjoy preparing your ham this way. Savannah Style cookbook, given to us by a dear friend (the mother-in-law of our editor), has loads of lovely recipes. We take advantage of these gifts by passing on to you some of the great food ideas contained therein, with the additional hope that you will try them out and tell your friends and neighbors where you got it. We are always open to accept MORE recipe books from you, our loyal readers (hint-hint)! Sunday Cabbage appears to rate in the top rankings of cabbage recipes. Miss Evie’s Banana Pudding looks simple and quick. We thank Northside Baptist Church for sharing their recipes with us. Violet Schoening’s Strawberry Pretzel Salad looks very interesting. This recipe comes to us from our friends at Northside Baptist Church. From Plains Pot Pourri, we find Mrs. Wesley Smith’s Raisin Cinnamon Rolls. These are raised rolls that call for dry yeast and all that stuff that our grandmas did as a matter of course. But the work is worth the result you get. Keep in mind when heating the milk, hot liquid kills yeast. If it gets hot, let it cool before mixing with the flour and yeast. Wash, dry, salt and pepper chicken breasts. In bowl, mix sausage meat evenly in corn bread stuffing. Add sautéed onion, green pepper and egg. Take each breast and place 2 or 3 tablespoons stuffing in the hollow of the breast, overlapping a little skin to hold in place. Place in shallow pan. Bake at 350 degrees for 45 minutes or until tender and browned. Defrost and drain crab. Cook broccoli according to package directions and arrange in bottom of 1-quart casserole. This works best in a square casserole dish. Sprinkle grated cheese over broccoli. Melt butter in a saucepan and sauté onion until golden. Stir in flour, salt and curry. Gradually add milk and cook over low heat, stirring constantly, until thick. Stir in lemon juice. Add crab. Pour mixture over broccoli. Mix melted butter and bread crumbs and sprinkle over crab. Bake at 350 degrees for 30 minutes. Serves 4. Combine apple cider and water in saucepan; bring to a boil. Set aside. Remove skin from ham. Place ham in shallow baking pan, fat side up. Coat top with brown sugar. Insert meat thermometer making sure it does not touch fat or bone. Bake, uncovered, at 325 degrees for approximately 2 hours (22 to 25 minutes per pound), or until meat thermometer registers 160 degrees, basting every 30 minutes with cider mixture. Combine remaining ingredients in a saucepan, bring to a boil. Serve sauce with sliced ham. Pour milk in small saucepan; bring to a boil. Make flour paste by adding a little milk to the flour. Add boiling milk until it becomes a thick white sauce. Add 1/4 cup margarine, seasoned salt, pepper and cheese. Cut cabbage in wedges and boil until tender, five to seven minutes. Drain cabbage, salt it and toss with remaining 1/4 cup margarine. Place half of the cabbage in a 1-quart dish, dice eggs over top and cover with half of the cheese sauce. Top with buttered bread crumbs; repeat second layer in same order. Bake at 350 degrees Fahrenheit for 30 minutes or until bubbly. Mix milk and water. Add pudding. Beat two minutes. Fold in Cool Whip. Put small amount of pudding in bottom of dish. Layer wafers, bananas and pudding, ending with pudding. Sprinkle with wafer crumbs. Mix 3 tablespoons sugar, pretzels, and butter. Put in 9 x 13-inch pan. Bake at 400 degrees for 8 minutes. Let cool. Combine cream cheese, Cool Whip, and 1 cup sugar. Spread on cold crust. Mix Jello in boiling water, add strawberries (let thicken slightly). Gently pour on top and refrigerate overnight. In mixer bowl, combine 2 cups flour and the yeast. In saucepan, heat together milk, the 1/4 cup sugar, Crisco and salt, just until warm. Stir to melt Crisco. Add to dry ingredients in mixer bowl. Add egg. Beat at low speed on electric mixer for 1/2 minute. Scrape sides of bowl constantly. Beat three minutes at high speed. By hand, stir in enough of the remaining flour to make a soft dough. Place in greased bowl, turn once to grease surface. Cover, let rise until double (1-1/2 to 2 hours). Turn out on floured surface; divide dough in half. Roll each half to a 16-in x 8-in rectangle. In small bowl, combine the 1/2 cup sugar, butter and cinnamon. Spread half the mixture over each rectangle. Top with raisins. Roll up like a jelly roll, starting with long side. Seal long edge. Cut in 1-inch slices. Place cut side down in two greased 9-in x 9-in x 2-in baking pans. Cover, let rise until double (30 to 40 minutes). Bake at 375 degrees for 20 to 25 minutes. Drizzle with confectioners sugar glaze before serving.